Maitland Street Green Space is in the seaside city of Victoria, one of thirteen communities that form the Capital Regional District of British Columbia. 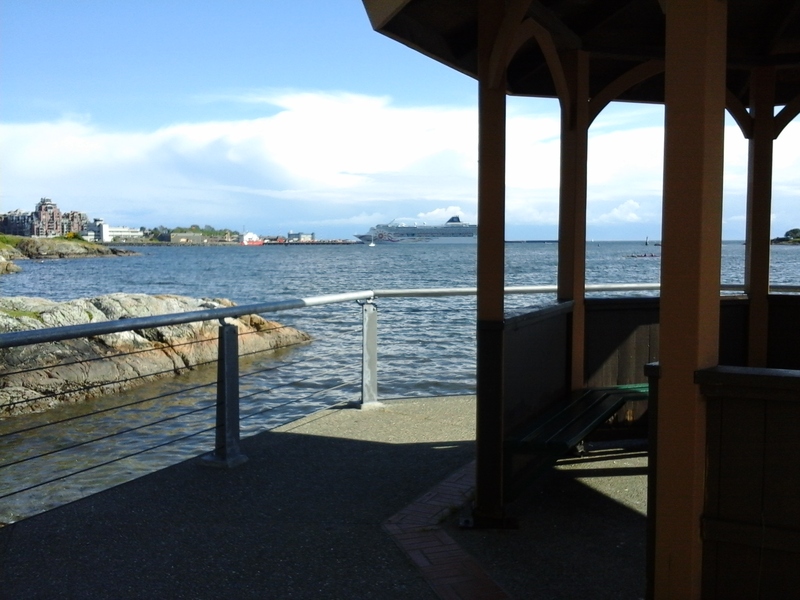 As Maitland Street curves into Seaforth Street you get a glimpse of the waters of Victoria,BC. There is a long staircase that leads to sandy beach along the Westsong Walkway at Maitland Street Green Space. There are a few large Garry oak, shore pine and arbutus trees bordering the footpath. 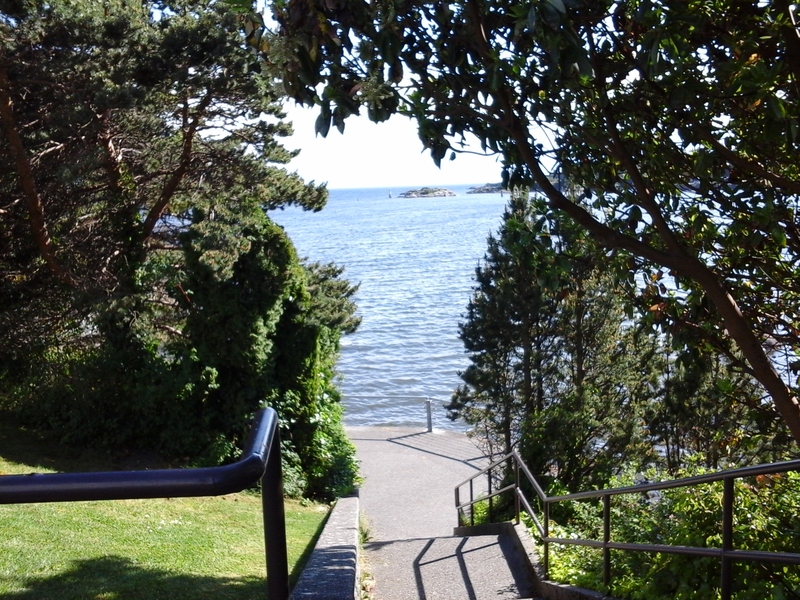 Descend the forty or so steps and walk west to reach the shoreline gazebo with wall benches. It provides a nice refuge from the sun and wind, as well as, the rain. 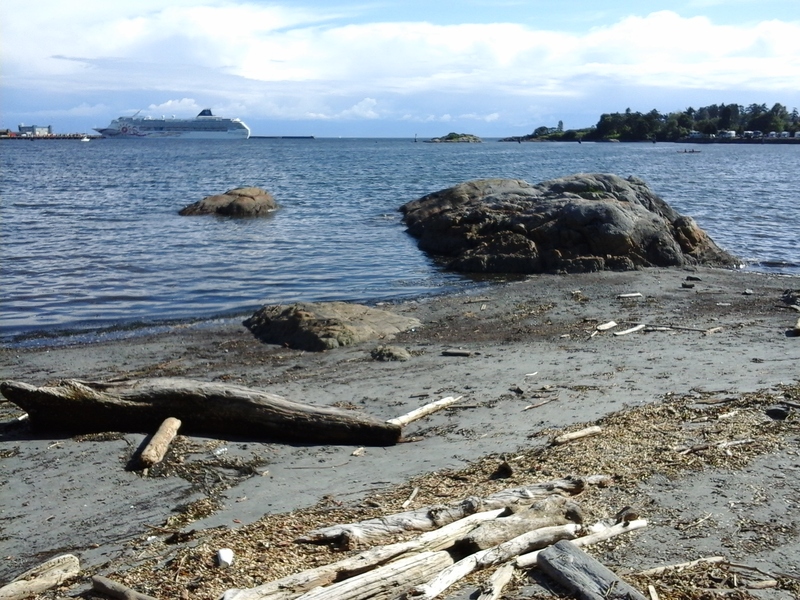 At lower tides, you’ll find a couple of small sandy areas to lounge or to launch a kayak, paddle board or canoe, if the winds are right. The view is across to the harbour to West Bay, Work Point and further across the Strait of Juan de Fuca to the Olympic Mountains of Washington State, USA. If you continue west along the walkway you’ll reach Barnard Park. Alternatively, it is short walk eastward along Westsong Walkway to Coffin Island Point and, if the tide is low enough, to Coffin Island. Continue around the next corner to reach Robert Street Green Space and Rainbow Park. Maitland Street Green Space can be reached from the Trans Canada Highway. continue along the highway as it becomes Douglas Street. Turn west onto Johnson Street and continue across the bridge as the road becomes Esquimalt Road. Turn left, about seven street later, onto Maitland Street. As the road curves to the left look for the pathway to the beach. A city bus travels along Esquimalt Road from downtown.